The Rhode Island Watercolor Society is proud to announce that starting in 2017, the Albrektson Award of Excellence will be given to the first place prize winner of the Annual Artist Member Show. 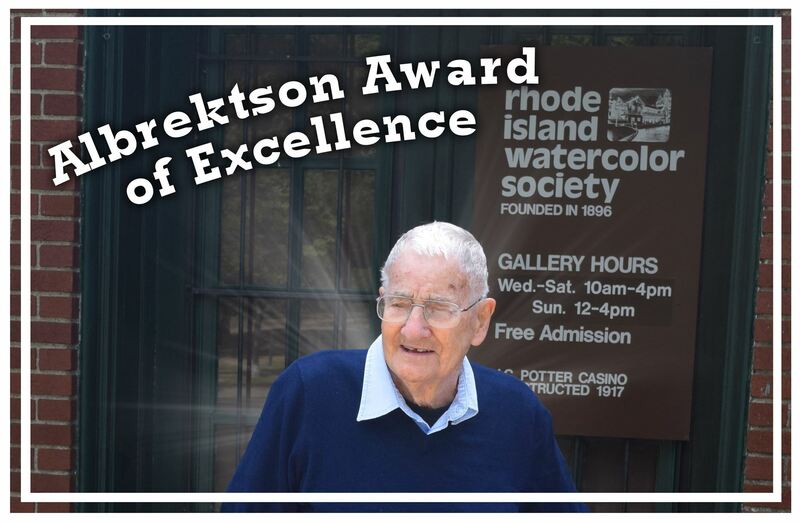 At 97 years old, Al Albrektson continues to be a huge source of inspiration for our community and we are honored to help celebrate him. Al not only continues to paint, but often takes home a prize ribbon from our shows here at RIWS. We're thrilled to be offering the Albrektson Award of Excellence this next year and for many years to follow. This award will offer RIWS an opportunity to celebrate both Al and his ongoing achievements as well as other members of the community that can now look forward to winning this award with pride! If you would like to help this award continue to grow, we're currently accepting any level donation to put toward this award. All checks can be made payable to the RHODE ISLAND WATERCOLOR SOCIETY. 100% of donations will be put toward the Albrektson Award of excellence.